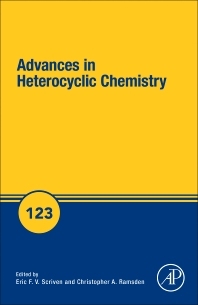 Advances in Heterocyclic Chemistry, Volume 123 brings together the fields of biology and organic chemistry, highlighting the ways they increasingly intersect. This updated volume includes a section on new developments in tetrazole chemistry, a section on the synthesis and applications of thiophene derivatives as organic materials, and a synopsis of the properties and applications on heteroaromatic rings in medicinal chemistry. Written by established authorities from around the world, this comprehensive review combines descriptive synthetic chemistry and mechanistic insight to yield an understanding of how chemistry drives the preparation and useful properties of heterocyclic compounds. This definitive series in the field will be of great value to organic chemists, polymer chemists and many biological scientists.